Microsoft is doubling down on its cloud AI services for business customers with a fleet of new offerings aimed at helping companies deal with video and unique problems not solved by its off-the-shelf cognitive services. New services announced Wednesday include a new Video Indexer service that will provide customers with automated captioning, sentiment analysis, custom face recognition, object detection, optical character recognition and keyword extraction of videos they provide. The tool is built on existing Microsoft services, but gives customers an easier way to process large amounts of video for indexing and analysis rather than require manual work by humans. Also new is a custom image recognition service that allows users to take Microsoft’s existing tools for detecting objects and teach them to recognize other things that aren’t generally applicable. For example, manufacturers could use the service to identify different types of parts that Microsoft’s off-the-shelf image recognition service couldn’t recognize, according to Irving Kwong, a principal product manager in the company’s artificial intelligence group. Other new offerings in that vein include the Bing Custom Search Service, which lets companies embed custom web search on their sites; a Gesture service that’s designed to help businesses build gesture-recognition tools; and the Custom Decision Service, which is designed to automate choices between different content. All of these new functions are aimed at helping non-experts use machine-learning capabilities to improve their businesses. They build on an existing suite of Microsoft Cognitive Services that include image recognition, language understanding and other capabilities. The idea of customizable but easy-to-use tools for solving problems like image recognition isn’t a new one in the tech industry. Salesforce has its own offering for image recognition, while Rekognition from Amazon Web Services is used to power face detection of politicians in CSPAN footage. The Video Indexer should help organizations more easily understand the content of videos that they own. When users upload a file, the service takes a few minutes to process it, and then will provide information like a transcript of the footage, faces present, a graph of sentiment throughout the video and a set of keywords extracted from the content. 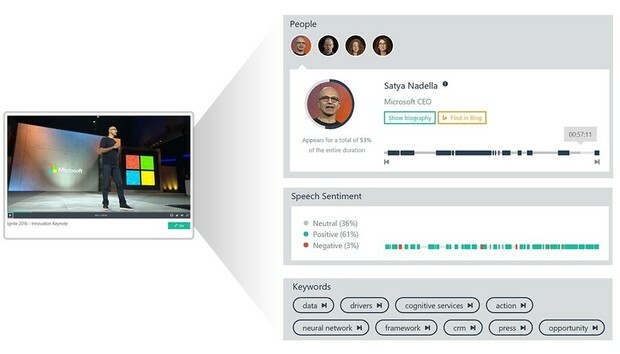 The facial recognition feature is particularly interesting, since it will automatically detect particular celebrities (a demo showed it automatically identifying Microsoft Executive Vice President Scott Guthrie) and also remember user-defined individuals across multiple videos. Because the Indexer automatically transcribes the contents of a video, users can then use that to create translated captions, based on Microsoft’s machine translation capabilities. Microsoft’s Bing Custom Search service comes at exactly the right time for enterprises. Google announced that its Site Search service will no longer work after April 1 of next year, which means businesses that previously relied on it are looking for other options. Bing Custom Search lets businesses build domain-specific search engines that don’t carry Microsoft branding and which can be embedded on their websites. It’s a move by the company to take what it’s learned from running a massive, public search engine and apply it to the enterprise. The Custom Decision Service is somewhat difficult to explain. It’s designed to take in a set of choices and provide users with the ones it thinks will work best, based on a technique called reinforcement learning that’s designed to teach machines how to optimize for certain behaviors. Microsoft uses the technology behind the Custom Decision Service to do things like determine which ads to show on Bing and what content to display on MSN.com. Users will be able to do the same. All of this news comes as part of Microsoft’s Build developer conference, which is taking place in Seattle this week.